Heat oven to 350°F. In medium bowl, stir cookie mix, oil and egg until soft dough forms. Shape dough into 24 balls. For each cookie, wrap 1 dough ball around candy bar. Place 2 inches apart on ungreased baking sheet. Bake 12 to 15 minutes or until light golden brown. Cool 3 minutes; remove from baking sheet to cooling rack. If frosting cookies, cool completely. 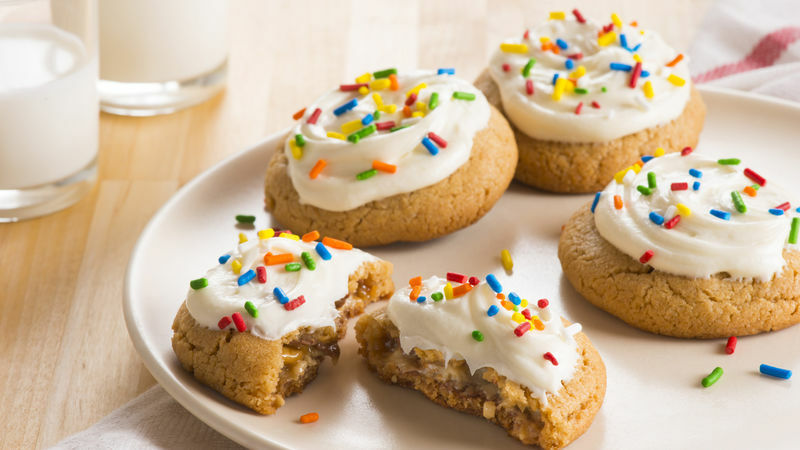 Spread frosting on cooled cookies; sprinkle with candy sprinkles. Store completely cooled cookies in airtight container. Time Saver Let kids unwrap the candies. Measure out the amount of dough to use, and they can also help wrap dough around candies. How-To Like to eat cookies while they’re warm? If you haven’t frosted these cookies, you can rewarm them by placing on a microwavable plate and microwaving uncovered on High 5 to 10 seconds or until surface of cookie feels warm to the touch. The time will vary depending on the number of cookies heated. Be careful of the hot caramel inside the cookies.